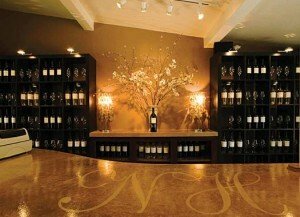 Newsome-Harlow is not exactly your “average winery”, really. Owners Scott and Melanie Klann have described the winery’s conception as having sprung from their “sensual, symbiotic pairing that embodies Bacchanalian hedonism at its finest — the kind that brings together wine, food, friends and copious amounts of laughter.” That’s what they’ve aimed to do and that’s what they’ve succeeded in creating. Joining forces with Steve and Gretchen Rael, they’ve created a fantastically impressive tasting experience — from their divine zinfandel offerings (they have non-zins and whites, as well) to the scrumptious feasts prepared in Melly’s Kitchen. And speaking of Melly’s Kitchen, folks who pull up a chair there can enjoy some of Calaveras finest and freshest foods as prepared by one of the most creative chefs in the area (none other than Melanie Klann, or Melly for short), sip incredible pairings and even join The Party (the winery’s wine club).